Subaru has launched a new ad campaign done by agency Carmichael Lynch featuring the 2018 Crosstrek. One of the spots, titled “Forever Young”, features an old man with a long-lasting vintage Subaru going fishing, at the crack of dawn, on a remote beach. A young surfer driving a 2018 Subaru Crosstrek, who’s also shown throughout the ad on the road, having his morning coffee at the wheel, arrives at the same place. 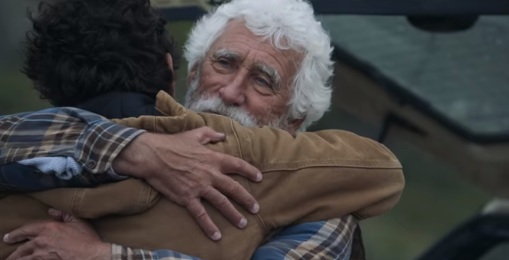 The two greet and hug each other and the latter, who proves to be the old man’s grandson, asks him if he told grandma he was going fishing again. “Maybe.” – the senior, who actually went there to surf, answers. The spot ends with the two swimming in the ocean on their boards and with the voiceover – expressing the young man’s thoughts – saying “The best things in life keep going. That’s why I got a Subaru, too”. A final onscreen line reveals that “98% of Subaru vehicles sold in the last 10 years are still on the road.” and then the campaign tagline, “Love is out there. Find it in a Subaru Crosstrek.” is heard.